Radio wave is one of the most beautiful effects that you can achieve in After Effects. Many people are obsessed with having radio wave in their content. If you are not sure how you can go about adding this effect to your videos, then you will find this explainer very useful. Take a look at a detailed description of the Radio Waves effect and how you can add it to your content. By following this guide, you can create the perfect Radio Waves effect and even adjust the waves from one shape into another. FilmoraPro is a professional video editor to easily make radio wave than After Effects. Basically, you just need to drag and drop radio waves to timeline. You can use bloom, lotus and more presets to make beautiful and interesting radio waves. You can adjust its shape, fade in/out, shift, opacity to make it precise. In the end, you can blend to integrate radio waves with yout video. Just download it now to have a try (Free)! The Radio Waves effect is designed to add radiating waves from the control point of a stationary or animated effect. With this effect, it is possible to add effects such as pond ripples, sound waves or different geometric patterns. 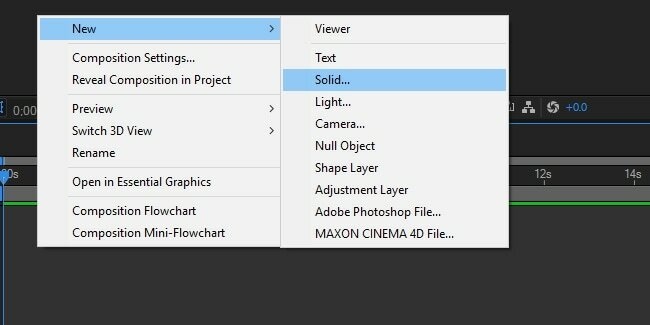 By using the Reflection control that is available in After Effects, it is possible to design the effect to make shapes bounce from the sides of the layer. 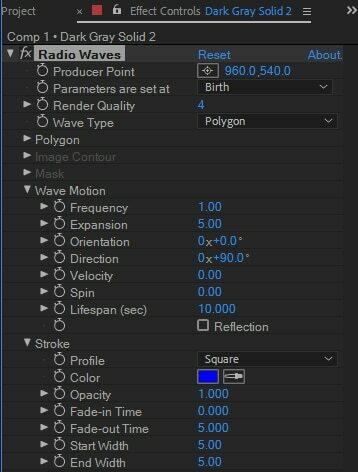 There is even an option to use the Radio Waves to make super realistic wave displacement maps. These will work well in conjunction with the Caustics effect. It is possible to get smooth and organic contours on the Radio Waves effect by using a higher value for the frequency. There is also an option for tweaking the Fade-in Time and Fade-out Time settings to get the desired effect within the video. The effect will work best with 8-bpc color. Step 2: Within the composition, click on solid, new and then adjust the settings to your liking. Step 3: Click on effect, generate, Radio Waves and you will see several options to adjust the effect. Step 4: Now you can adjust the color of the waves, the frequency, expansion, orientation and other settings to your liking. If you want to learn radio wave effect systematically online, you can also visit Lnyda to view learning video. Step 1: If you are hoping to tweak the radio waves in your video from one shape and then transform them into another, it is possible to do so by animating a mask path. The process is started by drawing a triangle and circle in a shape layer. Step 2: Then you can convert these shapes into the path. The circle will have four points and the triangle three – so it will be necessary to add another point for the triangle. Step 3: When you have added that point, you can set a keyframe for the triangle and then add a layer to start the path. This can be done with the pen tool and paste functions. You will now have a triangle shaped mask. Step 4: Now you must create a keyframe for the circle path and cut that out. Then you are ready to move the CTI into the spot on the timeline where you want your animation to stop. Paste it at that spot. Step 5: Pick your mask path and paste it. You will now have an animated mask. To add the radio waves, you will follow the tutorial above. Make the necessary adjustments so that you have the overall look that you wanted. Now you have the first wave generated as a triangle and the subsequent waves will be like a circle. 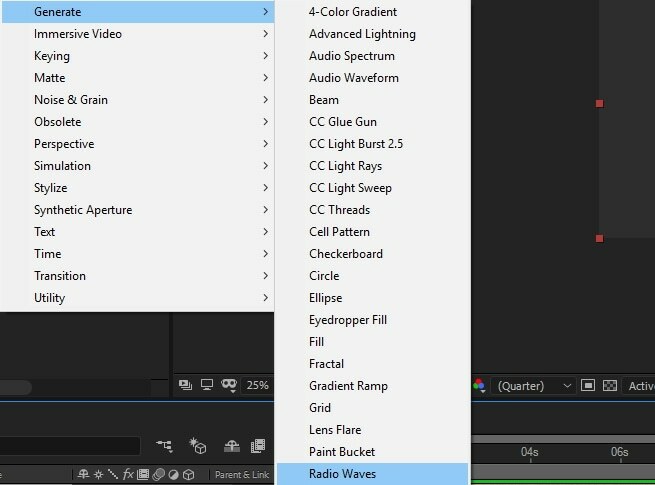 By following this tutorial, you are in a position where you can create Radio Waves in your videos. The beauty of this effect is that it can work for any object. Whether you are showing off a physical structure, human body, animal or any other object, the radio effect will be very impressive when done right.